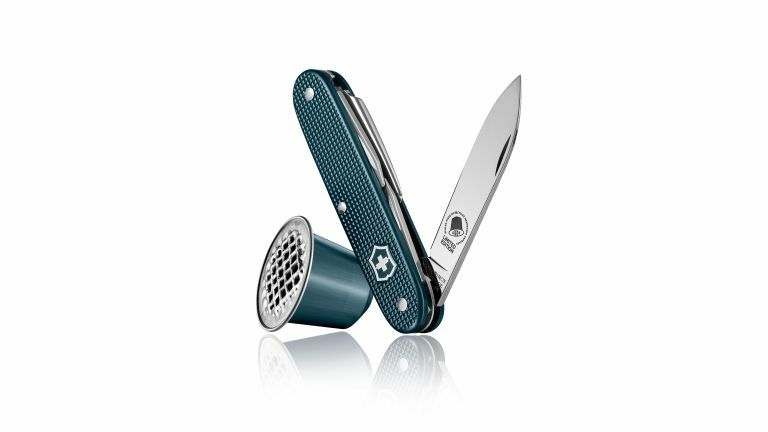 Victorinox and Nespresso have teamed up to create a limited-edition Swiss Army knife made from the aluminium of recycled Nespresso capsules. The new "Pioneer Nespresso Dharkan" model is finished in a beautiful midnight-blue, and features all of the useful tools you'd expect from a penknife. The seven practical tools include a large blade, reamer/punch, can opener, 3mm screwdriver, bottle opener, 7.5mm screwdriver, and wire stripper. Both Victorinox and Nespresso are iconic Swiss brands with a commitment to the environment. For example, Victorinox uses 100% recycled steel when making its knives, as less energy is consumed in the processing stage, while Nespresso has a widespread collection and recycling system for coffee capsules. The Pioneer Nespresso Dharkan is actually the third collaboration between the brands. Victorinox and Nespresso first worked together in 2016 to create the dark-purple "Pioneer Nespresso Arpeggio", celebrating 25 years of aluminium capsule recycling. It was followed a year later by the release of the warm-brown "Pioneer Nespresso Livanto". Available now, the 2018 Pioneer Nespresso Dharkan limited-edition knife is exclusively available from Victorinox priced at £49.